This year I'm making my own pumpkin spice lattes, for pennies (about 20 to 30 thin little pennies to make one fantastic pumpkin spice latte). To make them, I needed a pumpkin pie spice syrup. Da Vinci sells 25 oz. bottles of this syrup for between $6.50 and $7.99. Here's my homemade version (which by the way, is also delicious in tea lattes and cocoa), with a cost of about 35c, for 7 oz (enough for 6 mugs or so), roughly 1/5th the price of the store bought syrup. As a bonus, it has real, pronounceable ingredients, including pumpkin -- so you get a serving of vegetables in every mug, right? There are many recipes online for pumpkin spice syrup, here's mine. In a non-reactive saucepan, combine sugar, water and cinnamon sticks. Bring to a simmer over Medium and reduce heat to Med-Low, and keep just below a simmer for 5 minutes. Stir in cloves, ginger and nutmeg. Simmer for 5 additional minutes. Remove cinnamon sticks (set aside if you wish to reuse them, see below). Using a whisk, blend in pumpkin. Simmer for 2 minutes. Remove from heat. Line a strainer with 2 layers of cheesecloth and place over a medium sized container. (Don't use a paper coffee filter, it won't strain through very well.) Pour mixture through cheesecloth. To help the liquid portion of the mixture pass through the cheesecloth, stir up the sediment from the bottom a few times. Store in a covered container in the fridge, and use within 3 weeks. Alternatively, store in the freezer in individual serving portions and use within 6 months. Just a note -- while you could use ground cinnamon, cinnamon when cooked in water, thickens and becomes gloppy. The cinnamon sticks are the way around this. And you can reduce the sugar by substituting Splenda or stevia for half of the sugar, and still have a very flavorful syrup. heat 5 oz. (150 mL) of milk in a mug in the microwave, until steaming. Add 2 to 2 1/2 tablespoons (30-45 mL) syrup (stir up before measuring), 1/4 teaspoon (1.25 mL) vanilla extract (optional, but I think it boosts the flavor) and 1 shot of espresso or 1/2 cup (120 mL) double-strength coffee. Reheat in microwave for about 15 to 20 seconds. Top with whip cream and a dash of nutmeg. This would be a really fun beverage to have going in a crock pot on Thanksgiving, from morning to midday, as family and friends are arriving. What to do with cinnamon sticks and sediment/pulp from straining? You know me, I'm not about to let those goodies go to waste. I freeze the cinnamon sticks in a container and reuse either in a second batch of this syrup or for spiced cider. And the pulpy stuff I add to the next batch of muffins or apple pie. Have your pumpkin spice latte with a warm from the oven pumpkin scone -- recipe here. What's your favorite autumn-themed beverage? Cinnamon sticks are great for decorating wreaths and other things especially around Christmas time. They don't have to have a lot of flavor left in them for that. That is a fantastic idea. Even in a bowl of autumn potpourri. I'd probably want to boil out the sugary-ness in a pan of water. But then the sticks could have another life! Awesome! :) I guess my question is how do you make expresso or double strength coffee... I don't think I'll ever buy an expresso machine because I just don't care for it, and since I have a keurig I'm not sure if I can play around with the amounts of coffee and water. So I'm just curious if you have a special machine or another way to make it. I got a bag of dunkin donuts pumpkin coffee the other day. SO DELICIOUS! I've even had two cups some days! :) I do need to find a cheaper supply for my next one though: this was $7-8 and I usually shoot for $4-5 lol. I'm sure it's out there! 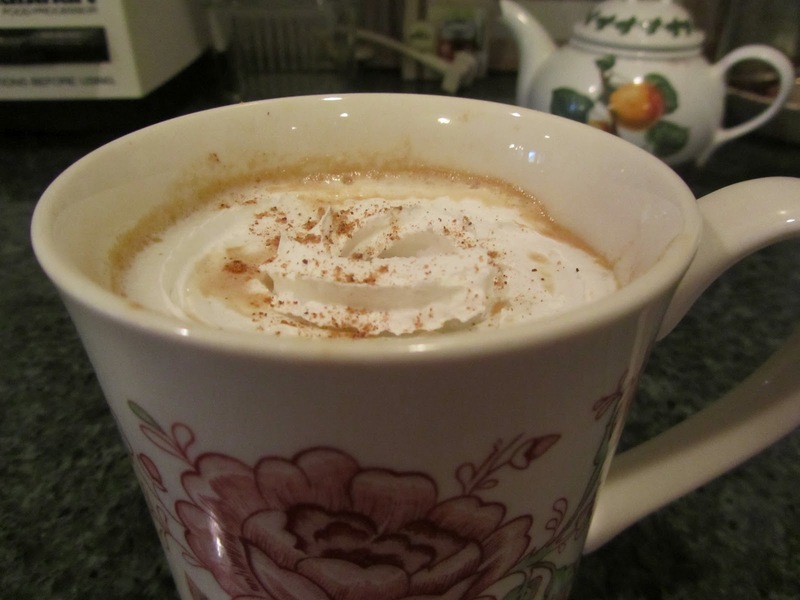 I'm happy you have a way to make delicious pumpkin spice lattes! I'm sure it's way better than starbucks (all their lattes start to taste the same after a while, regardless of flavoring)! If you're looking for flavored coffees for less, one place I've seen them is Marshall's in the gourmet food section. About $5-$6 for a bag of flavored coffee. Not super cheap, but I've bought some for parties before. A random question - I noticed today that your web address has .com.au at the end of it, is this only because I'm looking at it in Australia? The .com.au must be a routing thing for you. At this end, no au after the .com. Strange, huh? In fall there, do you have pumpkin flavored other foods, like pumpkin bread and cookies? Just wondering if pumpkin is not a big fall flavor there. I haven't seen any pumpkin cookies or breads, mostly we eat it roasted (yum! ), in soup or in curries. But it would be nice in sweet stuff because it is so sweet you wouldn't need a lot of sugar. I even heard of pumpkin fudge the other day! The picture and description had me salivating until you added the coffee. It's a taste and smell I have never been able to tolerate. I may try something similar and see if I can come up with something similar. My favorite treat during the autumn months isn't a drink, it's a dessert. I love pumpkin rolls. Of course pumpkin muffins, pumpkin pie....I love pumpkin! My two daughters want to try this, but they don't drink coffee (thankfully). I'm going to make them a blanco version -- no coffee, just milk, syrup, vanilla, and I'll whisk in a spoonful of pumpkin, then heat in the microwave, before topping with whip cream and nutmeg. I love pumpkin anything too. Pumpkin Pecan Stickie Buns is one of my favorites. I wanna invite myself over! Too bad it's such a long commute! That looks absolutely yummy. I never thought of making my own syrup--I usually shy away from syrups because of all the added sugar, but this I could control. Could you use the syrup on pancakes? And I'm looking forward to your scone recipe. Most scone recipes seem to come out dry for me. I know about the too much sugar issue. You can definitely make this with less sugar. You can substitute stevia or splenda for part of the sugar, or just have a less sweet version. And this would be great on pancakes. If you made this with less sugar, it would have a thinner consistency, just an FYI. But you can remedy that with some cornstarch added to thicken it. That's how I make lite versions of pancake syrup. I'll try to get the scone recipe up over the weekend (you know us bloggers, we want to have photos to go with posts). Since I grow pumpkins and then even buy, or obtain for free, extra pumpkins (I'm a bit obsessed with pumpkins), I do use them as a fat substitute in baking, just the same as most folks use applesauce. Great idea on the crustless pumpkin pie! I love that phrase -- more happy, less hippy! I love coming up with treats that have some nutritional value, too. We occasionally do blueberry sauce or cherry sauce for pancakes, and I was thinking, hmm, a sweet vegetable pancake topping! Great! I know this is out of season for most of the US, but we do rhubarb sauce for pancakes. We have pancakes for dinner a couple of times a month, and I almost always make some sort of fruit sauce to top them (gotta get in a fruit at least). I haven't tried this on pancakes (at least not yet) but I bet pumpkin butter would be good on spice pancakes. Pumpkin season always makes me happy, but shelling out $5 on a latte kills some of that buzz. I can't wait to try making this version at home! I already have two Sam's Club sized cans of pumpkin in my cupboard - I can't wait to make cheaper, homemade versions of some popular seasonal items! Pumpkins make me happy, too. It sounds like you're going to be doing a lot of baking in the near future! I'm a hot chocolate or hot tea kind of girl. I think I'm an equal opportunity hot beverage consumer. I like coffee, tea, cocoa, spiced apple cider, and hot vanilla milk. Right now I'm using the pumpkin spice syrup in a tea latte. It tastes a lot like chai tea latte. It's late in the afternoon and I didn't want too much caffeine. you're right! It's good for a lot of things. I thought it was quite good on fresh apple slices this afternoon, and right now I'm enjoying a pumpkin spice tea latte.